A biography of biographer Giorgio Vasari that reveals how a Renaissance scholar reshaped the visual world. 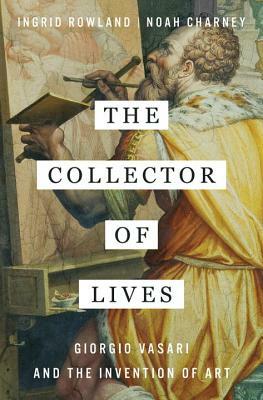 The Collector of Lives focuses on the cultural politics of the 16th century and the vicissitudes of fortune, both Vasari’s and those of the artists he describes … Ms. Rowland and Mr. Charney’s book opens in the Palazzo Vecchio with a tantalizing, Dan Brown -style tale of the hunt for Leonardo’s lost painting depicting the Battle of Anghiari, which some believe to be hidden under one of Vasari’s own frescoes … The authors are more interested in demonstrating Vasari’s continued relevance. This is a case that hardly needs making; Vasari remains on the lips of every Renaissance art historian. Nonetheless, Ms. Rowland and Mr. Charney make frequent reference to contemporary culture and art … Readers curious about the making of Renaissance art, its cast of characters and political intrigue, will find much to relish in these pages. This is a lively, highly readable point of entry into an important and fascinating text. [Giorgio Vasari’s] life was as remarkable as that of any of those Renaissance masters whose adventures he chronicled. Although the vignettes he related were notoriously untrustworthy, you can choose to be generous and contemplate the thousands of facts and critical opinions he managed to get right. Ingrid Rowland, a prominent scholar of Renaissance art and history, and her fellow writer and historian Noah Charney, wear their erudition lightly in their gracefully written biography … Astoundingly, as Rowland and Charney make clear, no one before Vasari had written a series of artist biographies. There were lives of poets, lives of philosophers; there were rollicking lives of depraved rulers of the Roman Empire. But those subjects belonged to the upper classes … The biography as a whole settles for breeziness and even glibness when close analysis is needed. How these two scholars came to work together isn’t made clear, but their book’s subtitle, Giorgio Vasari and the Invention of Art, seems a somewhat audacious claim. Perhaps ‘the invention of art history’ would be more accurate? Though mainly a life of Vasari — and one contending that he is a major — their book also touches on many of the civic, intellectual and aesthetic currents of 16th-century Italy … Such historical tidbits are unquestionably entertaining, but they also render The Collector of Lives a bit of a hodgepodge — unless, of course, the authors are deliberately emulating what the period’s rhetoricians called ‘copia,’ a flowery abundance. After a sensationalistic opening — Could there be a lost Leonardo behind a Vasari fresco? — the book does settle down, but many points are tediously repeated … Because of these blemishes, The Collector of Lives lacks anything approaching Raphael-like perfection. You should read it anyway. What did you think of The Collector of Lives: Giorgio Vasari and the Invention of Art?